With all the care put into presenting the perfect bird accompanied by beautiful mouthwatering sides, don't forget to complete your meal with attractive and refreshing beverages. Along side the wine and apple cider, fruit-infused water is a great, light beverage to offer your guests. I'm a huge fan of infusing water with fruit and you almost never see me with a glass of water unless it has ample ice and a wedge of lemon, orange, lime or some berries in it. 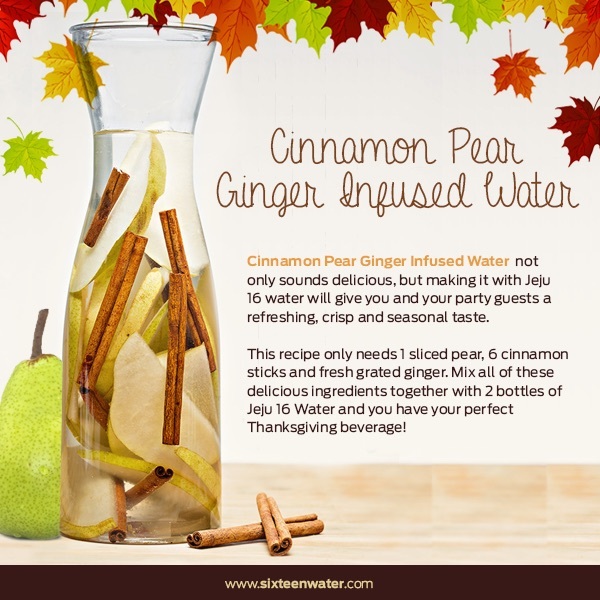 I've never tried pears before and this sounds like a great recipe where cinnamon sticks and fresh ginger are added with the pear to Jeju 16 bottled water, which is the #1 water brand in Korea and is also gaining popularity in Japan. This is a great way of adding a bit of seasonal flavor to your table and one that your guests are sure to love.